Southeast Asia’s roads are home to over 20 million cars. This number is expected to rise to 62 million by 2040 according to the International Energy Agency (IEA). At the same time, new high-speed rail systems are being built all over the region, resulting in the recent infrastructure boom. The growth of the transportation sector is a welcome sign as it indicates that the region is catching up economically with the rest of the world. The buying power of Southeast Asians is increasing and they can now afford to buy more cars. The increased mobility and connectivity of its citizens would also indirectly grow economic activity in the region. The potential downside to growth in the region’s transportation sector is that it could drive up demand for oil. Countries such as Norway, Germany, France and the United Kingdom (UK) have already announced an end date for the sale of gasoline and diesel cars. Norway has set its deadline as 2025 earliest, Germany and India in 2030 while France and the UK are planning to end the sale of gasoline and diesel cars in 2040. Meanwhile, other countries are also mulling the same action. Southeast Asia is predicted to go against such a trend. Data from the IEA shows that it is predicted that oil demand in the region would increase steadily. The report points out that oil demand is set to increase from 4.7 million barrels per day to around 6.6 million barrels per day in 2040. One of the main reasons for this is the region’s burgeoning transportation sector. Now more than ever, transportation is accessible by the masses. The introduction of budget airlines and the construction of more airports has also increased air travel within the region. The automotive sector is also rapidly growing. Last year, aggregate new car sales in Singapore, Indonesia, Malaysia, Thailand, Vietnam and the Philippines rose five percent to nearly 3.4 million units. Aside from that, it is estimated that vehicle ownership across the region is expected to grow more than 40 percent by 2040. To lower its dependency on oil, Southeast Asia needs to strengthen its renewable energy policy for transportation. One of the steps countries can take is to improve efficiency in their respective transport sectors. Some countries have already taken a step in the right direction with regards to this. An example is Singapore’s fuel labelling and emissions scheme that offers tax rebates for low-emission cars. The Carbon Emissions-based Vehicle Scheme (CEVS) calculates tax rebates or surcharges for vehicles depending on the amount of carbon dioxide they produce. However, Singapore seems to be the only country that’s leading this sort of initiative. Other countries are still slow in implementing such a policy. Governments should also take advantage of the growing electric vehicle (EV) market in the region. Since EVs run on electric power, they use significantly less energy and do not release carbon emissions into the atmosphere. It is estimated that by 2025, Southeast Asia could see 59 million two to three-wheeler EVs and 8.9 million four-wheel EVs on its roads. To meet the growing demand for EVs, manufacturers have to do their part too. Some countries may provide incentives for consumers to buy EVs but Thailand has chosen another route. It is offering tax incentives to manufacturers instead, so that the country can reach a target of 1.2 million EVs on its roads by 2036. Other countries in the region should also follow suit and introduce incentives and subsidies that suit their respective fiscal positions. Most of Southeast Asia has also realised the importance of public transportation. A good public transportation infrastructure would lower a country’s dependency on cars. In turn, this would decrease traffic congestion and reduces air pollution. Major cities such as Manila, Jakarta and Kuala Lumpur are undertaking major efforts to revamp their respective public transportation infrastructure. 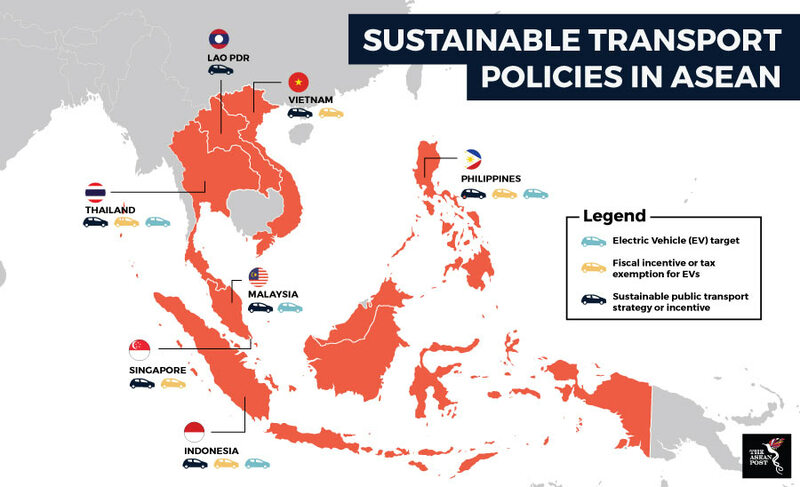 While ASEAN has its own renewable energy policy and targets, the transportation sector is often times overlooked. As ASEAN countries become more integrated and interconnected through multiple railway projects, they need to develop an overarching energy policy for the transportation sector. Meaningful impact can only be seen if the region moves together instead of resorting to an uncoordinated patchwork of policies.